Japan has always been characterized by the character of its people, their perseverance and improving attitude. Many times, the Westerners have complained about how Japanese people are able to take a Western idea, polish it, improve it and, also, sell it cheaper. The case of progressive rock isn’t an exception. Many Nippon bands (Bi Kyo Ran, Ars Nova or Bellaphon, for example) maintain the progressive purity of Western bands like ELP, Camel or King Crimson. In this case, Gestalt (great name, by the way, inspired by the old European psychological school) have taken their entire musical source from the symphonic inspiration of the old continent in order to offer a rough and violent CD, full of risk and originality. The authors of this novelty are Ryo Ozawa (drums and vocals), Tatsua Yoshimoto (keyboards, sax and choirs), Hiroaki Shibata (guitars and choirs) and Toshimi Nohara (bass, choirs), even though at the beginning of the recordings Ryo was the one in charge of the bass and Nobuhiro Katagiri of the drums. "Gommorha vs Khan" is divided into two parts that represent the fight between technology and tradition, something that must be common in Japan. 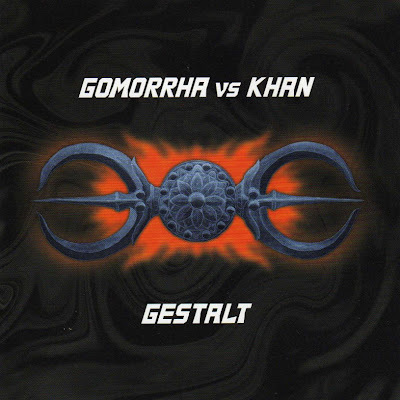 Khan is "The oriental side" and starts with "Sysonic introduction" (1:00), a monastic-oriental overture with synthesizers and Tibetan trumpet (I think) that ends in a theme whose name is written in Japanese characters and lasts 2:52, showing Gestalt’s fierce and intensity. Oppression, drama, distortion and chaos are embodied in zeuhl voices, distorted guitars and circus joggling games of plates. "Khan" (6:43) conjugates the Crimson spirit gone long ago, via a filter of Eastern music with some denser Magma or Gong–like parts, and also includes some shades of the San Francisco's Bay Area Hard-core (Death Angel) in the drum sections. Another track with Japanese title (6:24) brings us to a hypnotic rhythm full of percussion's and with a strong Arab atmosphere, going crescendo to conclude with a Crimsonian sax solo. With "Celtic song" (6:35), the band shows its more melodic side thanks to a mid section with a great guitar and a tremendous keyboard solo in the purest 70´s style. This "traditional" part concludes with "Wakt The Istikad" (7:10), if I can say, the most progressive part in this first lot; dubbed guitars, frantic basses, constant rhythm changes and piercing keyboards... what else would you want?. We enter the "Psy-Phy side" (Gomorrha) that begins with a very spacey intro (0:59) of a Japanese anime flavour. "Gomorrha" (7:08) gives an idea of what this part of the disc will be: many more keyboards and more technological sounds on which the rest of the instruments are based and evolve. Magma and Hawkwind shake hands in a party during which the voices – in the style of U Totem - follow a crescendo that ends in a controlled chaos. If this track seems odd to you, then "Allien" (5:43) is even odder due to its extraterrestrial sounds, musical breaks and oppressive ambiance, reaching sometimes the progressive thrash style of bands such as Canadians Vöivöd. "Cyberstates" (3:53) is calmer and follows a style closer to King Crimson’s "Fallen Angel" (take a look at the lyrics... they are in binary code!). Great bass and more harmony. "Son of the sun" (4:05) is definitely another of the most brutal themes, and mixes the more Seventies-like keyboards with some Korn or Tool tendencies. To conclude, "Black Hole" (8:03) presents us with some sounds of static electricity and computers mixed with guitar arpeggios in a very minimalist structure. The intensity increases with the other instruments, leading to a saxophone solo that closes this essential CD.